Vareniki is a little pockets of dough that can be filled with anything. The fact that this dish actually came from Turkey, where it was called dush-vara. Turkish dish “dush-vara” has become a “vara-niki” and then “vare-niki.” Having tried the Turkish dushvara (or how we call it “dushbara”), the Ukrainians were delighted and turned it into their own dish, by changing the stuffing and a dough recipe. Sift the flour into a bowl. Add the egg, salt and water, and start kneading the dough until the dough attains medium thickness. Shape the dough into a ball, cover with plastic wrap, and set aside for 20-30 minutes to rest before rolling. Wash the cherries, discard the stems and remove the pits using a cheery pitter. Mix the cherries with the sugar and set aside for 30 minutes to reduce the juice. Dust your working place with flour and start rolling out the dough into a large thin circle, approximately 2-3 mm thick. 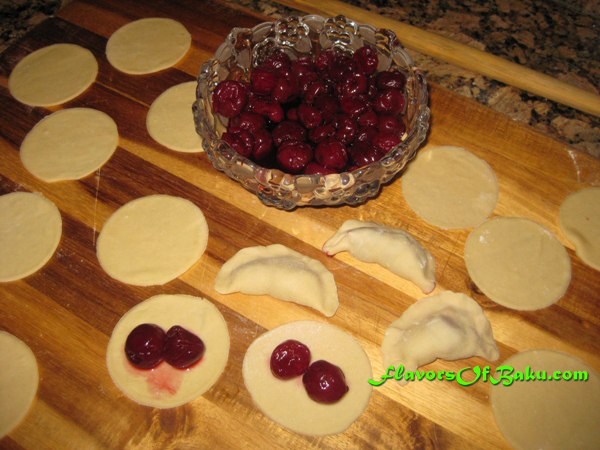 Cut the dough into circles with upside-down drinking glass or round shape pastry cutter. Place two cherries in the middle of each circle, fold them and pinch the ends together. Make sure that the edges are well sealed. Bring a large pot of lightly salted water to a boil. Put not more than10 vareniki at a time in the boiling water and gently mix them with a spoon. They should not be crowded in the pan or they will stick. Lower the heat and simmer them until dough is tender and vareniki are floated. Remove them from the boiling water with a slotted spoon and drain thoroughly. 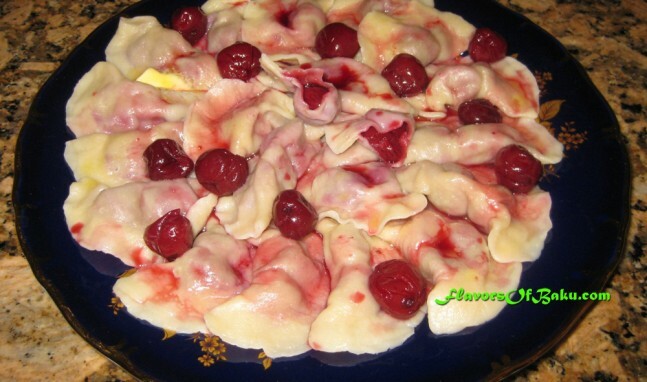 To serve Cherry Vareniki, drizzle with a little butter and sweet cherry sauce.